Imagine roaming the endless plains of Masai Mara National Reserve in Kenya on day-long game drives, witnessing dramatic interactions between hunting animals and the hunted, then returning each night to an old-world East Africa tent camp. Today’s mobile tent camps are a true indulgence, even though they are a throwback to the days of early explorers. It’s an adventure in the wild—but also in style. You’ll feel like Roosevelt or Hemingway might have on their safaris in the early 1900s but with better service and less surly company. There’s no running water, no electricity, and you’ll dine by candlelight—from necessity not romance. You’ll sleep in a canvas tent that’s open to cool night breezes fluttering among the trees that camouflage it. Masai Mara forms the northern extension of the Serengeti–and the Siringit tented camp where my husband Larry and I stayed while on safari in Kenya is an amazing experience in living among native wildlife. 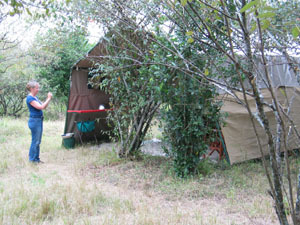 Mobile camps such as this provide responsible rather than destructive tourism–important as more people discover this unique destination. Tucked in a remote location near the Mara River, our camp was ideally situated for the annual migration, during which nearly a million wildebeests and other animals travel from the Serengeti in Tanzania into Kenya. Watching these large animals jump into the Mara River and frantically splash across as crocodiles threatened in the water was an incredible sight. An abundance of lions, elephants, zebras, giraffes, gazelles, cheetahs, ostriches, and bird varieties too numerous to remember made each day’s drive an exciting yet different experience. beds and drove off-road through the grasslands. Herds of wildlife roamed, grazed, and hunted on the savannah as mountains in muted purple and blue hues formed a picturesque background. At lunchtime Bernard found a lone balamite tree to provide shade as we unpacked the generous picnic provided by our Masai chefs. At day’s end we returned to camp, tired and dusty. Lucky for us, Masai staff were ready to attend to our needs by cooking meals as sumptuous as those prepared in upscale resort kitchens, toting hot water to our tent for showers, and setting a golden campfire around which we shared drinks and adventure stories. Mobile tent camps (as opposed to permanent tent camps) are the best way to experience the wilderness because you begin to feel part of it instead of just an onlooker. Wild animals can be heard nearby, but Masai warriors patrol the grounds around the camp day and night to ward off any intruders. 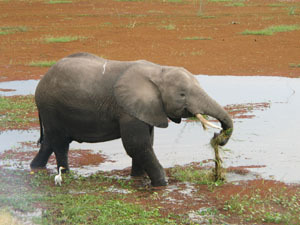 You’ll remember the experience as a highlight of your African safari. 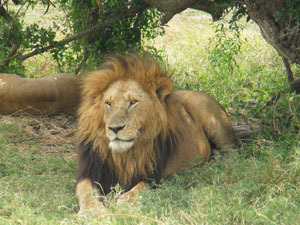 Now is the perfect time to plan a late summer or early fall safari, when weather is most pleasant in East Africa. 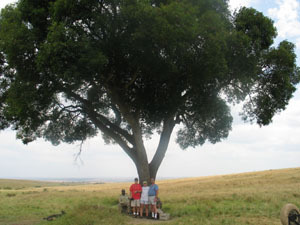 Interested in finding a mobile tented camp in or near Masai Mara National Reserve? Check these websites: www.ecoafrica.com www.go2africa.com www.safarinow.com International Expeditions www.ietravel.com can set you up with a group tour or plan a custom itinerary for your African journey.